yarning along again... i have gotten to the part where i add the pocket to the sweater, so that is encouraging! we finished pippi, although i skipped over the last part where they find guns in the attic and pippi shoots two holes in the roof. (?!?!) i was also a bit worried colden would be distraught by the 4 year-old and 5 year-old that pippi saves from a burning house (their mother left them home alone while she ran an errand). 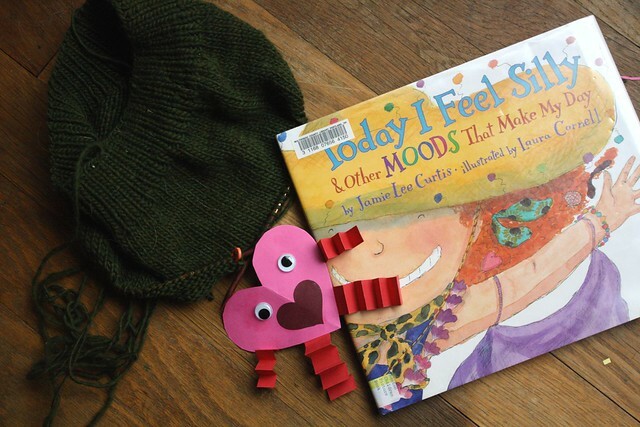 we checked this book out from the library and it is a fun exploration of feelings. i couldn't resist adding our heart guy to the picture. here are a couple book lists i've come across this week that look awesome. i have read plenty of the first and second lists (or had them read to me as a child - thanks mom! ), but none of the third. i am excited to read lots of these.